WGA offers a personalized approach to health powered by genetic research and technology products and services. WGA improves employee engagement and wellness with genomic programs and services with the potential to reduce healthcare and pharmacy spend. 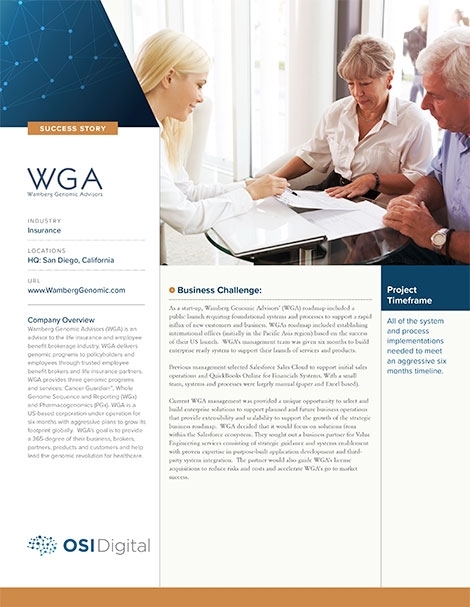 WGA acts as an extension of businesses to create customized programs and full-service enrollment and communication offerings. As a start-up, Wamberg Genomic Advisors’ (WGA) roadmap included a public launch requiring foundational systems and processes to support a rapid influx of new customers and business. WGAs roadmap included establishing international of offices (initially in the Pacific Asia region) based on the success of their US launch. WGA’s management team was given six months to stand up enterprise-ready systems to support their launch of services and products. All of the systems and processes needed to be implemented to meet an aggressive six-month timeline. The value-add that OSI Digital brought to WGA was their ability to keep systems very simple and maintenance free. OSI not only implemented a solution on-time and on-budget but also made suggestions and recommendations that resulted in cost-savings over the long-term. OSI partnered with Dell Boomi for WGA’s integration needs and together they helped move data between WGA and its partners in real-time and on schedule.